There is nothing quite like a hot bowl of Instant Pot Chili with some corn bread. That’s some comfort food right there, as Grandpa would have said! 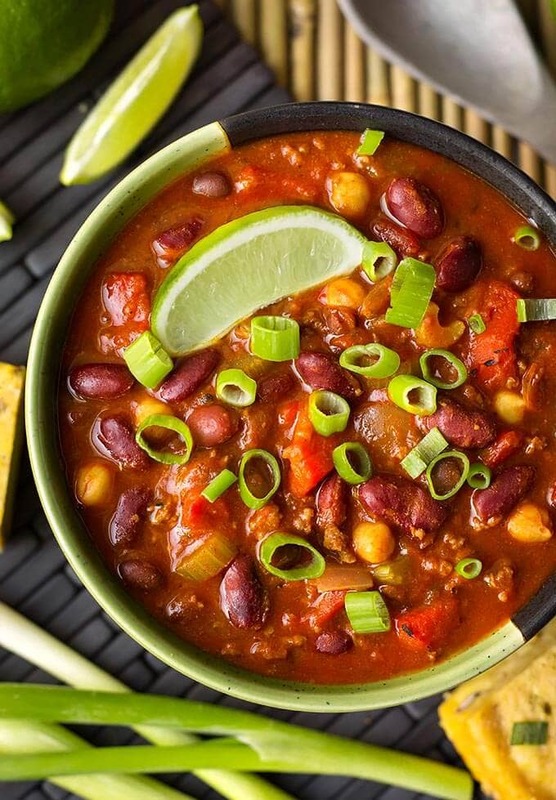 Once you try my Instant Pot Chili, I think you’ll agree! When you make pressure cooker chili, it makes the flavors more rich, for lack of a better word. It cooks in less time than on the stovetop, and you can set the Instant Pot and go do other things while it cooks. Chili is a dish I make often in our house. I’m known for it in our circle of friends and family. This chili has been to almost every party and gathering we’ve had in the past 12 years! This is a recipe that I make on the stovetop, and it recently occurred to me that I had never tried converting it to an Instant Pot Chili. I don’t know why, I guess I revert to autopilot when I make this recipe and drag out the big cast iron pot! Well, I have to say, my chili made in the Instant Pot is amazing! I’m so happy I converted it. Now I’m sharing it with you! Usually, I make this chili recipe with 93% lean ground turkey, and sometimes with 90% to 93% lean ground beef. This chili is delicious with either meat. It’s probably good without meat, too, though I have never tried that. The guys would picket the kitchen! I find that using a trio of beans enhances the overall enjoyment of the chili for me. 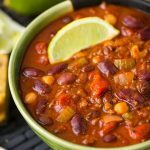 I started doing this with my baked beans, and we all really liked the variety, so I started doing this with my chili recipe, too! My chosen trio of beans are black, red kidney, and garbanzo. I like pinto beans, and cook with them a lot, but I just thought they were a bit too strong for this chili. Personal preference. You can add them and see what you think, if pintos are one of your favorite beans, or that’s what you happen to have. 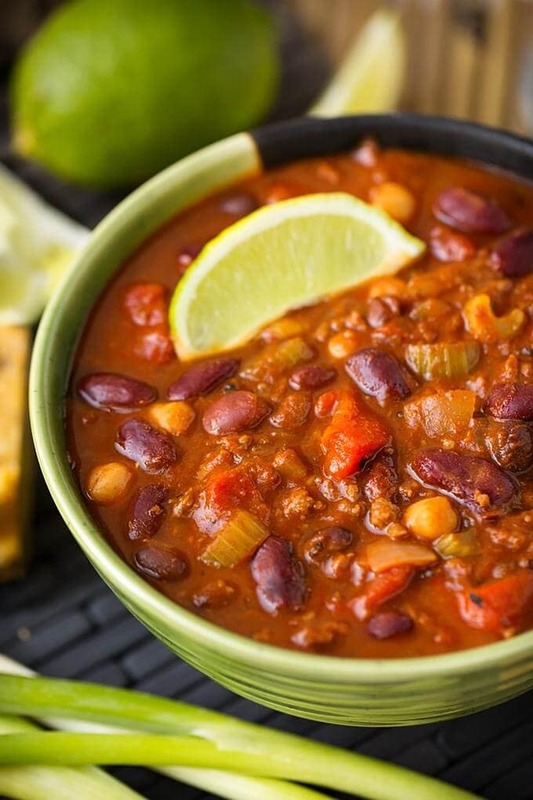 So get ready for some comfort food in the form of Instant Pot Chili! Serve this up on Game Day and feed a crowd! Bring this to your next pot luck and you will be asked for the recipe! My original recipe for my famous chili adapted for the Instant Pot electric pressure cooker. This is a thick, delicious chili. I'm known for it! I hope you enjoy it! Set the Instant Pot to the Sauté mode. When the display reads “Hot” add the meat. Cook, stirring occasionally, until almost done (if you use 93% lean or higher, you won't need to drain the fat. You'll need a little to cook the onions). If you use ground turkey, you might need a little oil. Add onion, celery garlic, and oregano. Cook for about 5 minutes, stirring occasionally, until onion starts to turn translucent. Add Bay leaves, salt, pepper, smoked paprika, cumin, chili powder, and chipotle chili powder. Stir well. Add the diced tomatoes, tomato sauce, roasted red peppers, and broth/water. Stir well. Press the Manual (or Pressure Cook) button and then the + or - button to choose 10 minutes. When the cook cycle is finished, let the pot sit and naturally release pressure for 20 minutes minimum. This is a big full pot, so it will take time. Then manually release the remaining pressure by turning the steam release knob to Venting. Serve with your favorite chili fixings and some cornbread! As long as the pin is still down, and there is no steam hissing out of the pin or knob, it is safe to open it as there is no pressure built up yet. I think this is important to save thicker foods from burning. That and making sure to deglaze the pot after browning meat, etc. How do you deglaze the IP? Deglazing is when you scrape up all of the browned bits that stick to the bottom of the pot when you are browning meat, etc. To deglaze it you keep the heat going and add some kind of liquid like broth, wine, etc. That helps loosen that stuff up. That browned stuff is called FOND, and add a lot of flavor to the recipe. Getting it off of the bottom of the pot helps you avoid the BURN error that the pot will give you when the contents are too thick or something is burned to the bottom of the pot. This recipe is absolutely delicious! It is on my make again and again list of recipes. I have the Fagor 8qt Multicooker and it worked beautifully! This recipe is absolutely delicious! I have the Fagor 8qt Multicooker and it worked beautifully in it! I served this with some tortilla chips and it was a big hit! This one is on my make again and again list of recipes! I’m so happy that you liked my chili recipe, Diane! Thank you so much for the great review! We eat this about once a week. We skip the chilies and chipotle chili powder (and beans) for our 4 year old and she loves it. Frito pie! That’s great! I’m so glad you like it! I made this tonight in my Instant Pot mini (so I cut the recipe in half) and it was delicious! We sprinkled some grated cheese on top and tortilla chips on the side, or crunched up on top and loved it! I will keep this recipe to make again. Thanks for another hit recipe. Thank you, Allison. I’m so glad you liked this recipe! Thank you for your review! I agree. Sandy is my “go to” chef for Instapot recipes. I’m just learning – I have a 6-qt for our home (a stationary 5th wheel trailer) and a mini for our travel-van. I’m hoping to learn, convert, cook, minimize pots and water usage, relax, and enjoy! Will be trying this for an upcoming church potluck… it sounds great! I love this chili! I used ground turkey and extra Chipotle!